“But here, however, it was all about Microdisney’s legitimacy as one of Ireland’s best – if somewhat mislaid – pop groups: songs such as Town to Town, Singer’s Hampstead Home, Birthday Girl, And, Begging Bowl, Are You Happy, Loftholdingswood, and Horse Overboard display equal signs of curdled rage and honeyed melodies…. Welcome back you little rascals” **** The Irish Times. 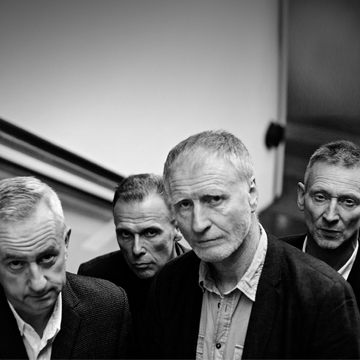 Cork band Microdisney featuring Cathal Coughlan (vocals), Sean O’Hagan (guitar), Jon Fell (bass) and Tom Fenner (drums) announce an exclusive Vicar Street show on 18th February 2019. Tickets available from Ticketmaster.ie and outlets Nationwide. After some 30 years the band reconvened to perform their seminal album, The Clock Comes Down the Stairs at the National Concert Hall and The Barbican in 2018. Having enjoyed that experience, the band will play a fully standing show at Vicar Street. Born of an insecure and troubled Irish emigrant experience of London in the 1980s, the album is dark, acerbic, witty and yet swathed in lush pop. Their unique sound is defined by Cathal Coughlan’s intelligent articulate lyricism together his, and with Sean O’Hagan’s sweet well-arranged pop melodies marking them as a band of fierce intelligence. Widely regarded as the greatest Irish record ever, with John Peel describing it as “the iron fist in a velvet glove” Microdisney’s The Clock Comes Down the Stairs was released on Rough Trade records in 1985, reaching No. 1 in the UK Indie Charts.